To think people said Jeremy Corbyn was crazy to join The Rocky Horror Show. What if you go in through a window, avoiding the doorway altogether? Stars in Their Eyes – Claymation Edition”. Pavoratti, when he saw that his roommate ate the cannoli he was saving. And some choose to go in by the back way. . .which is why it’s crucial to always remember your safeword. It looks like someone glued a magazine cutout to a doorknocker. The horror is Jacob Marley being typecast, and he has to share billing with a stunt double mouth. GSS on the Clutch Cargo reference. Though I’m surprised he made it across the pond. I first read the title as The Oxfam Horror. Wait a minute – “cut out cover”? Anyone know what was inside? “Classic cut-out cover w/mouth from next page”. @Tor – We have YouTube. Unfortunately the cut-out cover makes it look like the Burning Man hipster on the main cover has a severely broken or dislocated jaw. I’m guessing the cut-out cover is where the Rocky Horror-esque lips come through, and I shudder to think of what the stepback shows surrounding the lips. Are they just lips floating in nothingness? Or is there an even more horrific face? Amazon reviews say “A wonderful sleeping pill” and “pace slower than the gradual shifting of the earth’s plates”; two agree the book should have been 100 pages shorter. There are several other GSS-worthy covers there. @TW: Author’s real name apparently Mel Burger. 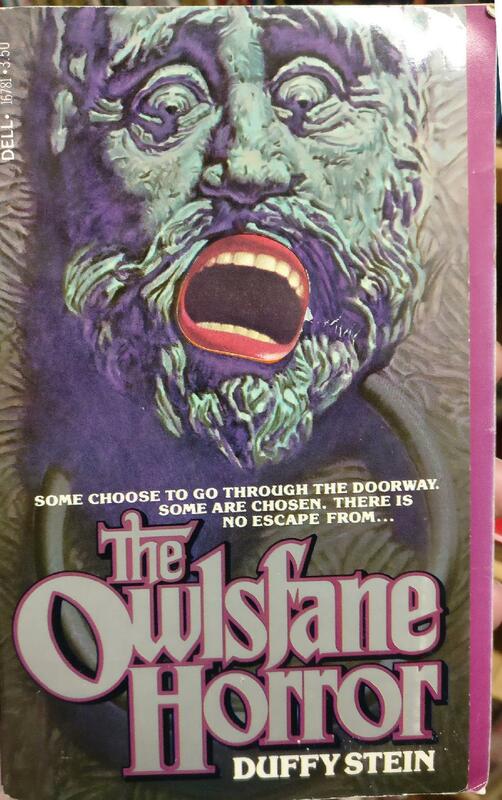 The Owlsfane Horror….where people are reincarnated as door knockers with mouths, and you have to insert objects into the mouths to enter. @A-S: A glory hole nightmare. I am sorry for letting my prejudices show, but an author by the name of Duffy Stein does not exactly promise a great horror read within. Neither does/did Mel Burger. What was wrong with D. (Middle Initial) Stein? Without the giant candy lips, this cover would actually be interesting. I refuse to believe this was as the artist intended. That “cutout cover” nonsense must have been forced by someone in marketing at the 11th hour.